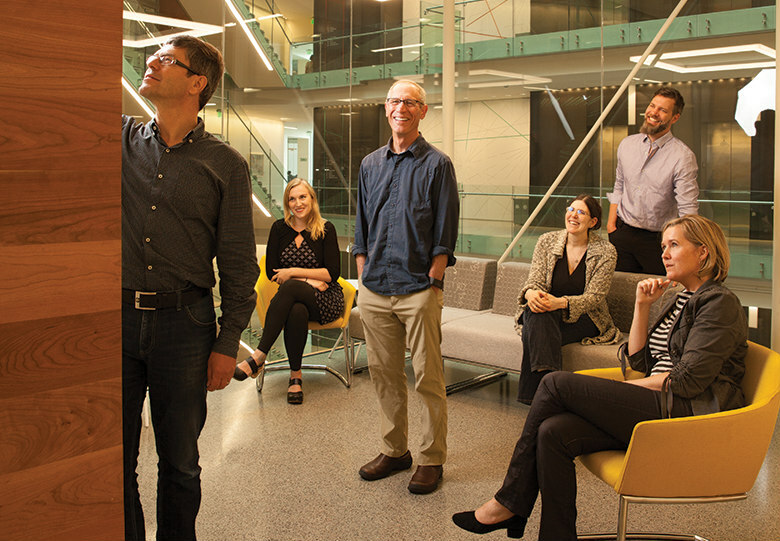 Rick Horwitz, center, promotes scientific collaboration in his role as executive director at the Allen Institute for Cell Science. Photographed on August 31 at the Institute’s South Lake Union offices. He left comfortable tenure at the University of Virginia about two years ago to lead the brand-new nonprofit Allen Institute for Cell Science here in Seattle—and he’s wasted no time. In April, Rick Horwitz, Ph.D., and his team opened the Allen Cell Explorer, a free scientific resource, accessible to anyone in the world, that has the potential to help speed up insights about drugs and diseases. The Cell Explorer allows viewers to “see” inside microscopic photos of once-living cells. Forget parts of the cell you labeled in seventh-grade biology: mitochondria, nucleus, vacuole. “We don’t know where any of that is,” Horwitz explains. The inside of a cell is dynamic, moving and churning to conduct daily chores. The Explorer gives viewers ways to see 3-D images that are built using living cells, which are photographed in ways that expose specific structures at work. Read about the rest of 2017's Most Influential Seattleites here.